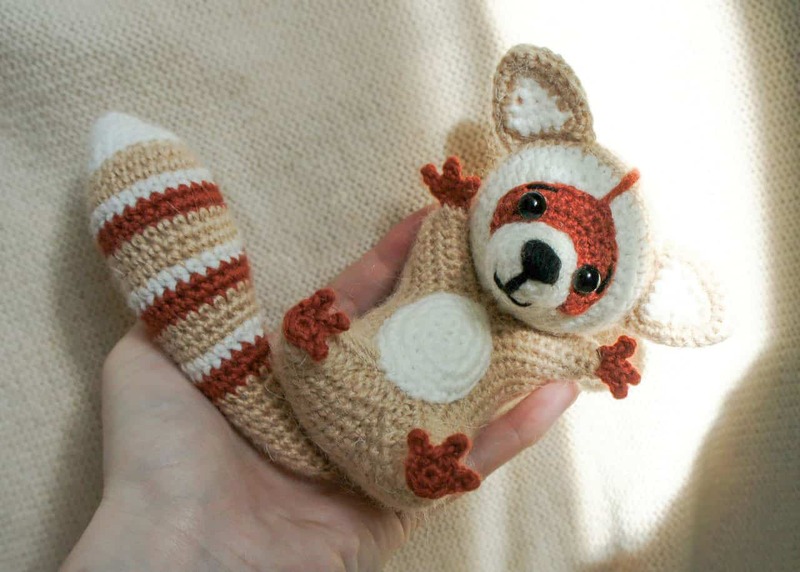 Make a heart-warming gift for your loved one, crochet a funny raccoon using the pattern below! Rnd 21: dec until the hole is closed. Row 2: 3 sc in second chain from hook, sc in next 8 st, 3 sc in last st . Turn. Row 3: 1 ch, inc, sc in next 5 st, (inc) x 2 times, sc in next 5 st, inc . Turn. Row 4: 1 ch, inc, sc in next 7 st, (inc) x 2 times, sc in next 7 st, inc .
Make 2 ch with white yarn. Row 1: 3 sc in the second chain from hook . Turn. Row 2: 1 ch, sc in each st . Turn. Row 3: 1 ch, inc, sc in next st, inc . Turn. Row 4: 1 ch, sc in each st . Turn. Change to light brown yarn. Crochet along the edges of the white triangle you got starting from its foundation. Row 5: 1 ch, sc in next 4 st, 3 sc in the corner st of the triangle; inc, sc in next st, inc on one side; 3 sc in the corner st; inc, sc in next st, inc on the other side; 2 sc in the corner st, join with sl st. Turn. Row 6: 1 ch, sc in next 8 st, inc in the corner, sc in next 8 st . Turn. Row 7: 1 ch, BLO sc in all 18 st . Turn. Row 8: 1 ch, crochet in front loops only: sc in next 8 st, dec, sc in next 8 st . Turn. Row 9: 1 ch, sc in next 7 st, 3 sc together, sc in next 7 st . Turn. Rnd 1: 6 sc in a magic ring – this is the base. 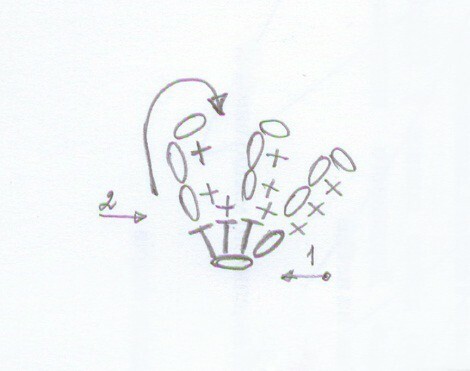 Rnd 2: fingers: (3 ch, sl st in second chain from hook, sl st in first ch, sl st in sc of the base) repeat 3 times. Row 1: 2 ch, 3 sc in second chain from hook – this is the base. Turn. Row 2: fingers: (3 ch, sl st in second chain from hook, sl st in first ch, sl st in sc of the base) repeat 3 times. When making color changes, don’t cut the yarn, hold it inside the tail. Stuff with fiberfill. Change to light brown yarn. For all next rounds make 1 dec per each round until you have 6 sc, then close the opening. If you want the tail to be bendable, insert wire frame in it. Row 2: sc in second chain from hook, sc in next 33 st . Turn. Row 3-33: 1 ch, sc in next 34 st. Turn. Now you’ve got a rectangle. Prepare the wire frame as in the picture below. Mark the middle of the smaller sides with stitch marker. 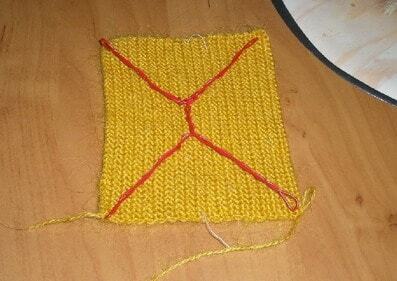 Fold in half each corner of this rectangle and sew the edges together carefully till the marked stitches. Insert wire for frame. Stuff with fiberfill and close the hole with sewing needle. 1. Sew the tummy to the body, stuff it with fiberfill slightly before you finish. 2. Sew feet to the legs and hands to the arms. 3. Sew tail to the body. 4. Sew the mask to the head so that there is a white rim of 2-3 rows above the upper edge. 5. Stuff the muzzle and sew it to the head as shown on the picture. 6. Sew or glue eyes on the mask. 7. 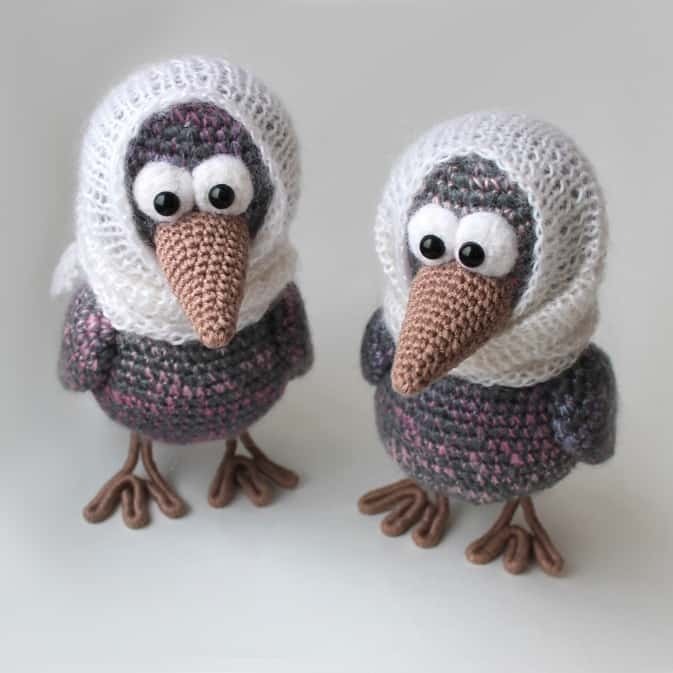 Embroider a nose, a mouth and eyebrows. 8. Pin ears to the head, then sew them on. 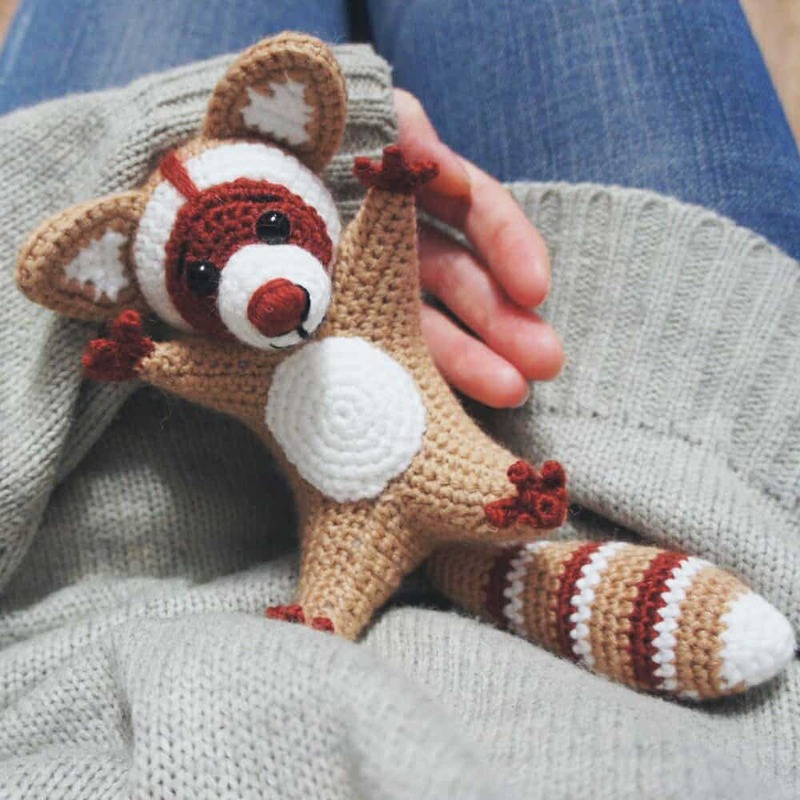 Your amigurumi raccoon is done! You can experiment with colors to create very unusual cartoon raccoons. Use your imagination! are we allowed to sell finished items made using this pattern? Todos muito lindos e com fácil explicação.Parabéns e obrigada por compartilhar. 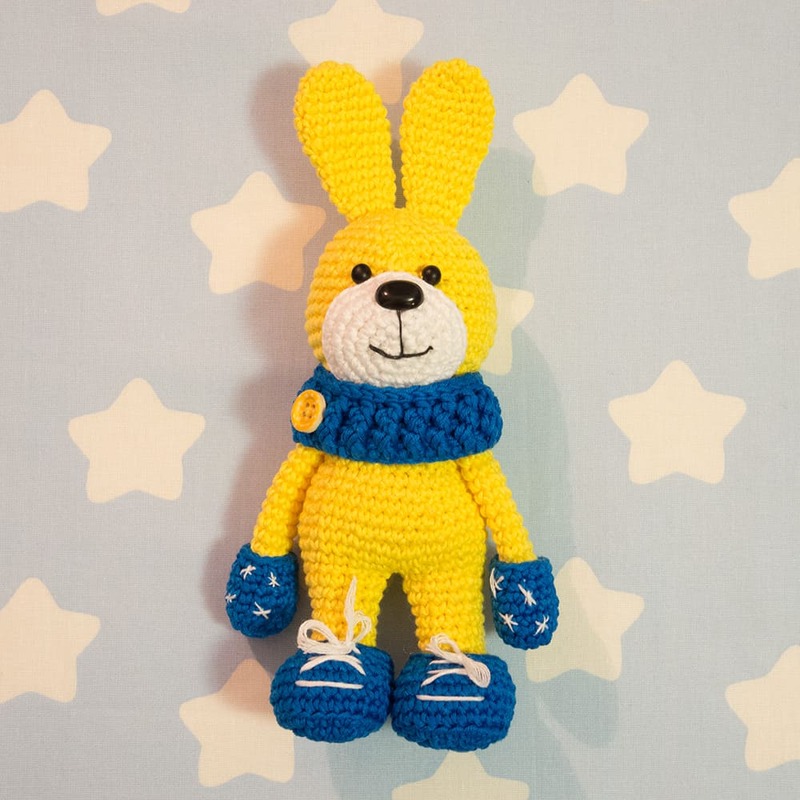 Hi was wondering how to finish off the ears or sew them on? It is open in the back and didn’t see anything explaining it. I love this raccoon! 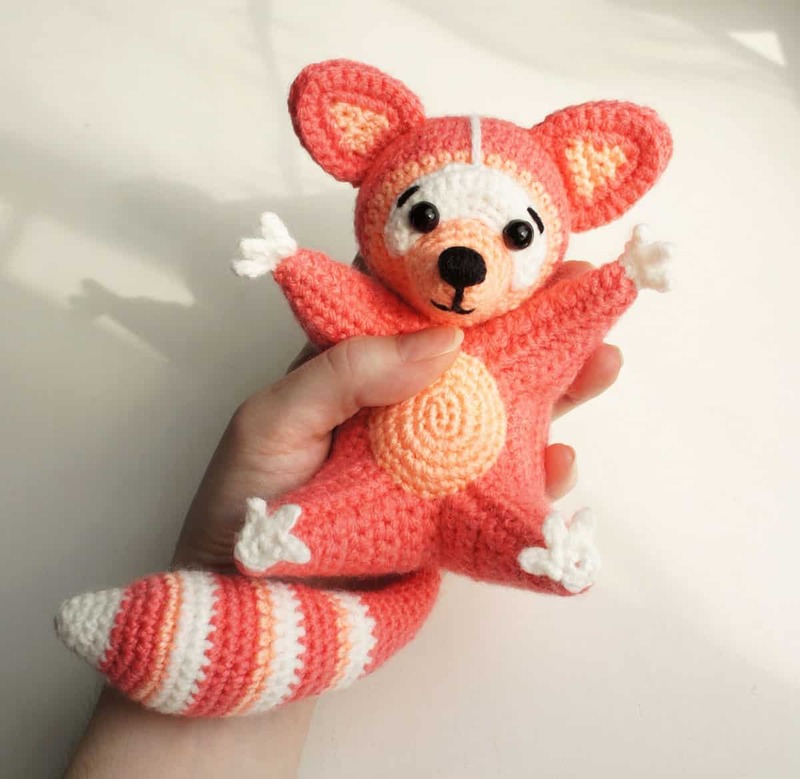 Need to practice so much to make it, but I will, it is adorable <3 Thank you so much for sharing!! Moro no Brasil, no Estado Bahia. Amo seus trabalhos. Voces não imaginam, o sentido que deram a minha vida. Hi! Love all your patterns! But I am confused about 1 thing. I’m used to yarn with numbers 1-6 on them telling me the weight that way. Could you please explain what weight a 5-ply yarn would be? I am enjoying this pattern but not quite sure how to accomplish the body. I will not put wire just in case it protrudes eventually out of the item. Is there a video I can see the explanation of the body? Thank You for sharing this with us it is greatly appreciated. I will send a pic once completed. Unfortunately, we don’t have a video tutorial. Thanks for your explanations, you are an artist and a very kind person to share your creations. 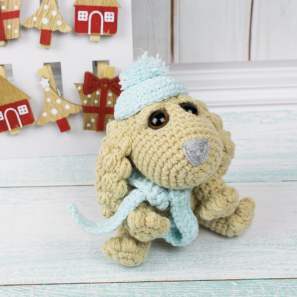 Hello there 😀 What size hook is used and what ply of yarn is used? 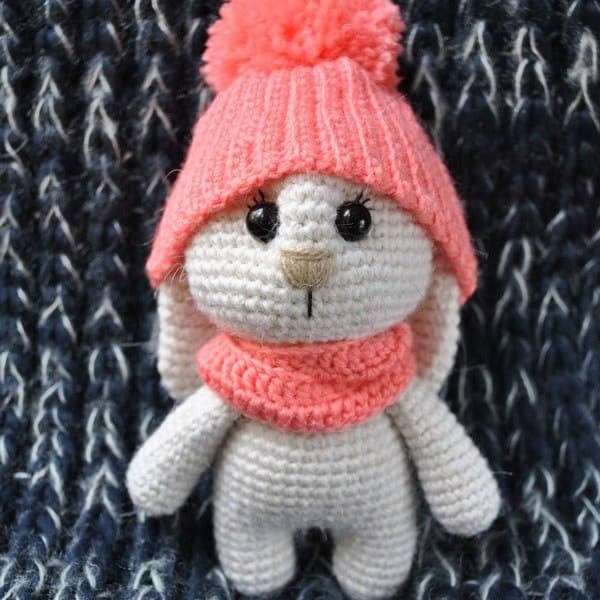 Hi Michelle 🙂 you can use 4 ply yarn and 2.0 mm crochet hook, or 8 ply yarn and 3.0 mm hook. 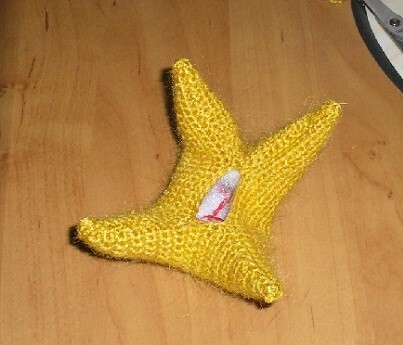 In case you make the toy with bigger hook, the size will be larger. Well this come out okay if I don’t use the wire? 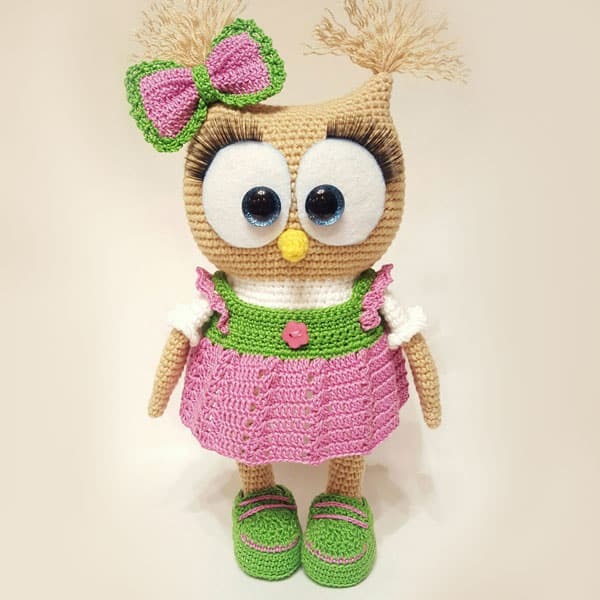 I’m new on crochet, does anyone can explain to me what means BLO and FLO? Thank You for the perfect pattern!! Bonjour. Très joli, merci du partage. Juste une question : comment faites vous pour placer les yeux ? Hello, you can use safety eyes or beads. 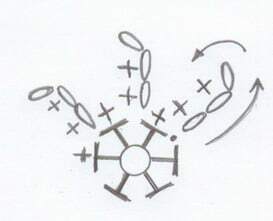 The place where they are attached is up to you. Merci pour tous ces amigurimis que tu partages ! Envie de tout réaliser. Your pattern is a sheer delight. The choice of colours is absolutely fascinating and eye catching. Had no idea that bodies can be created from some form of square, oblong, rectangle etc, to create a beautiful project. Thank you from the heart for sharing your wonderful creation. Peace and kindness.